SAF-T-EZE® Heavy Metal Free Anti-Seize is a graphite/calcium fluoride/aluminum anti-seize, which is devoid of heavy metallic ingredients. The product contains solid anti-seize components to provide high temperature lubrication and anti-seize protection. It is particularly recommended for applications that require an anti-seize, which does not contain high-density metals. 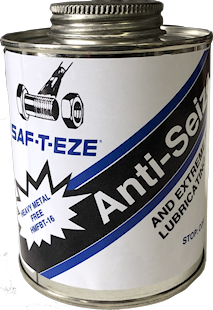 SAF-T-EZE® Heavy Metal Free Anti-Seize is an excellent anti-seize for titanium, stainless steel, and other steel alloys. It prevents corrosion, galling and seizure between metal parts, and is recommended for service up to 2400ºF (1315ºC). SAF-T-EZE® Heavy Metal Free Anti-Seize is particularly recommended for applications where different metals are being used. Its heavy metal free composition provides a lubricating barrier that prevents galvanic corrosion and seizing, even at extreme temperatures. It is an excellent choice to lubricate parts made of the various stainless steel grades. It is also a prime choice where nickel alloys, titanium, or other hard metals are in use, particularly in applications requiring the absence of high-density metals. Use on threaded parts, bushings, gears, valve stems, chains, sprockets, levers, hinges, pivots, rollers, heat exchanger bolts, manifolds, or in any threaded joint where a high performance, heavy metal free anti- seize is required. Use SAF-T-EZE® Anti-Seize for Ultimate Protection!